Costumed docent speaking before tour group outside Hale House (built 1887 in Highland Park). Los Angeles Almanac Photo. Heritage Square Museum is an open-air street in the Montecito Heights neighborhood of Los Angeles, alongside the Arroyo Seco Parkway (Pasadena Freeway), featuring buildings from Los Angeles’s past. Except for one, all structures were built between 1875 and 1899 and moved from their original locations in the Los Angeles area to the museum site. There are presently nine structures: five homes, one train depot, one carriage house, one church and one re-created corner drug store. There is also vintage train car and street trolley. Visitors enter through the depot and are led by volunteer docents in period costume on insightful tours through the homes, three of which are fully restored, complete with period furnishings. The docents tell stories of the homes and families who lived in them and how each reflects life in Los Angeles when they were occupied. The tour ends at the end of the street at Colonial Drug, a re-created drug store that opened in Highland Park after World War I and continued in business for six decades. The store features original fixtures, including a soda fountain, and an impressive collection of thousands of vintage pharmaceuticals and cosmetics, most dated between 1888 and 1950, most still in original packaging, most no longer made or used. Perry Mansion (built 1876 in Boyle Heights), Hale House, and Valley-Knudsen Home (built 1883-1884 in Lincoln Heights). Los Angeles Almanac Photo. 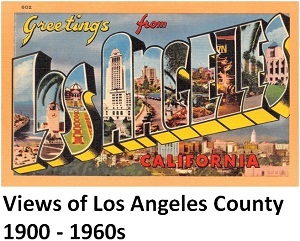 The story of the museum began during the rapid growth of Los Angeles during the 1960s, when 19th century buildings were quickly being demolished to make way for new development. When the last two residences on Bunker Hill, “Donovan's Castle” and the “Saltbox,” faced demolition, the City of Los Angeles Cultural Heritage Commission (a city agency) sought to save them. They hoped to move the homes down the hill to an open space between Olive and Hill Streets next to Angels Flight railway. They could not, however, seem to make that happen. Los Angeles Councilman Art Snyder then proposed moving the homes to a strip of parkland alongside the Arroyo Seco Parkway in Montecito Heights. Last Victorian homes ("Donovan's Castle" on right; white house "Saltbox" on left; center house was demolished) on Bunker Hill, 1966. Photo from LA Times Photographic Collection, courtesy of UCLA Digital Library. Hale House. Los Angeles Almanac Photo. The obstacle was funding. The Cultural Heritage Commission simply did not have funding for such a project. So, in 1969, a group of concerned citizens formed the non-profit Cultural Heritage Foundation of Southern California, Inc., to raise money to move and preserve the Bunker Hill houses and identify and save other architectural and historical structures in the Los Angeles area in danger of being demolished. They successfully raised the funds and were able to move the two Bunker Hill homes to the Montecito Heights site. Sadly, however, after all the trouble to trying to save and move the two structures to their new haven, they were destroyed in a fire. It wasn’t until the following year that two more rescued residences, the Hale House (originally located not far away in Highland Park) and the Valley Knudsen Home (originally located in Lincoln Heights), were moved to Heritage Square and the site was opened to the public. Valley-Knudsen Home. Los Angeles Almanac Photo. The long-term vision for the site was to be a living museum featuring homes, a church, train depot, bandstand and “downtown” area with a bank, general store, ice cream parlor, firehouse, restaurant, trolley barn and transportation museum. The museum would be a balance of historical authenticity and entertainment. All landscaping and amenities would reflect the period. Lincoln Avenue Methodist Church (built 1897 in Pasadena). Colonial Drug is just beyond. Los Angeles Almanac Photo. Heritage Square Museum continues to be a work-in-progress and a challenging one at that. Money from fund-raising (which must compete with cancer research and feeding the hungry) is always in short supply. Some buildings, such as the Lincoln Avenue Methodist Church, have patiently stood in significant need of restoration for decades and cannot be opened for interior tours. Even the beautifully restored homes, as with any home (especially those more than a century old), are a constant maintenance challenge. However, because of the efforts of dedicated volunteers and supporters, the homes that are open for tours are wonderfully restored and wonderful experiences, offering one of the few places where modern-day Angelenos can actually step over a time threshold into a much earlier Los Angeles. Front gate of Heritage Square Museum. Perry Mansion is to left. Los Angeles Almanac Photo. Note: Museum is located at the end of Homer Street, a long, narrow residential street. Parking is just outside the front gate.